…and anyone else who may be wondering how the hedgehogs are getting on in my garden. During the summer months they are rather hidden from view with the foliage of my plants - if they are out and about during daylight hours. I would love to see one during the day but alas I have not. I have never seen any young hoglets either even at night but once again the foliage would act as great cover for them. It is later on in the evenings I can get glimpses of any hedgehog visitors to my garden. On warm nights I don’t see them much at all but colder nights are much better. I don’t set up my night camera every night as it does need me to sit and watch the screen on my PC – I don’t use motion captures. I like to see these visits real time. For me, that’s the fun part of watching wildlife in the garden – especially with the night visitors and the action inside a Nestbox. Two nights ago I caught the following hedgehog visits to my garden. 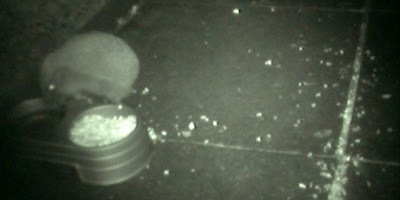 I tend to set up my night camera on a tripod positioning it with food in view. The film below shows a dish I put out in the open along a wall edge - I have noticed hedgehogs like to follow edges. The dish had crushed peanuts and fresh water from my water barrel. I also scattered some peanuts along the crack of the paving for any that were running past. Of course the hedgehog doesn’t always get in the middle of the screen! Dish outside feeding station, video 0:57 with background music, try 480p quality. Well, there you go you just never know what you’ll capture with a camera outside in the garden! The photo of the hedgehog drinking water and video of the hedgehogs eating peanuts were taken on October 7th 2008. The video of the woodpigeon was taken on August 21st 2008. Wow, what excitement you have in your garden Shirl. I do appreciate the hedgehog update. This hedgehog looks very plump and healthy. Wouldn't you love to see a line of little ones following the adult to the feeder?? Great capture. Even the Wood Pigeon is fun to watch. It looks huge compared to the hedgehog. (32cm). I could see them doing something like this Wood Pigeon. We call them Rock Pigs because they forage most every place. I have never had any in my garden though. Oh yes…. I would so love to see a hedgehog Mum with her hoglets following right behind her like a duck with her ducklings!! I have no idea if the hedgehog house that I built last year has been used. I keep convincing myself that perhaps the ground outside the entrance looks like something has been walking on it – wishful thinking! My daughter is designing and building one for an exam at school this year so next winter we will keep our fingers crossed that hers is used – that would be wonderful. Lovely :-) I've always wanted to set up a night camera. This is great fun to watch.